Everything. This line of four-door sedans and four-door hatchbacks gets a clean-sheet redesign that benefits from the brand’s Skyactiv suite of fuel efficiency-enhancing technologies. Eye-catching new styling is courtesy of the automaker’s “Kodo” (Japanese for “soul of motion”) design language. 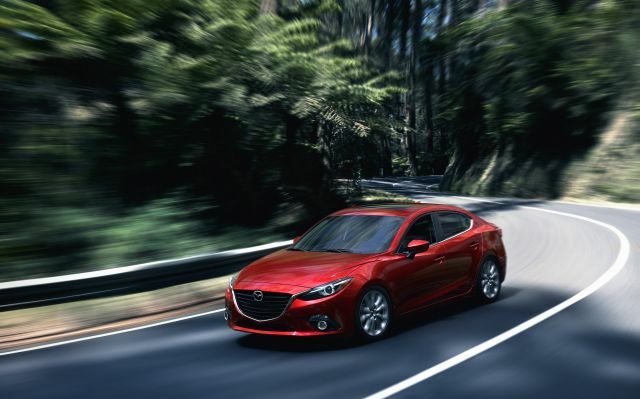 And the new 3 is packed with features, including lane-departure and forward-collision warning, adaptive cruise control, and Mazda’s Smart City Brake Support, designed to automatically stop the car before it rear-ends the vehicle ahead. To get the latest edition of a compact car that’s fun to drive, available with plenty of high-tech goodies, and stingy with fuel. This carmaker might not have the name recognition and marketplace presence of Honda, Nissan, or Toyota, but the company is looking to improve its position by releasing a steady stream of new and redesigned vehicles. The all-new 3 is the third such product, following the new-for-2013 CX-5 compact crossover SUV and the redesigned ‘14 Mazda 6 midsize car. The 3 is arguably the most important, though, since it’s Mazda’s best selling nameplate. Not much reason to. With the 3 fully redesigned, you’ll not likely benefit from significant updates or improvements by waiting for the ‘15 edition. But you will pay more. Yes. It’s familiar but different, and the better for it. Many design cues are shared with the larger 6, including a gracefully creased body and a beautiful new front end devoid of the previous 3’s disturbing smiling-clown grille. As with the rival Ford Focus, Hyundai Elantra, Subaru Impreza, and Kia Forte, most buyers choose the sedan body style. We’re partial to the hatchback. Both suffer a rear seat that’s a little tight compared with that of top competitors. But the hatch is more versatile and expansive, with 20.2 cubic feet of cargo volume behind the rear seat and 47.1 with the seatbacks folded. The sedan has a 12.4-cubic-foot trunk, about average for the class. Both body styles offer two grades under the “i” and “s” headings, depending on engine. Ascending Sport, Touring, and Grand Touring trim levels are available in both grades, with the sedan also offering an entry-level i SV model. Major upgrades throughout. All versions again have front-wheel drive and a four-cylinder engine, but it’s a new chassis and these are more advanced engines. That’s part of the Skyactiv push. It aims to improve performance and fuel economy by decreasing weight through the use of high-strength steel. Further gains are realized by powertrains with components that lower pumping losses and friction. Standard on all “i” variants is a 155-horsepower 2.0-liter that pairs with a six-speed manual or six-speed automatic transmission. The “s” trims have a 184-horsepower 2.5-liter linked exclusively with a six-speed automatic. Optional on the s Grand Touring is the carmaker’s new i-ELOOP technology, which uses a series of capacitors and a special alternator to generate and store the energy that powers the various electrical systems. The capacitors recharge when the vehicle decelerates, then go into action to power the auxiliary systems during acceleration. This means the battery is used solely to run the engine, which can potentially improve fuel economy. Still, that’s a far cry from a Mazda 3 hybrid, for which there are no immediate plans. A diesel engine is scheduled for the Mazda 6, however, and could potentially find a home as an option here. Almost certain is the near future return of the hot-rod MazdaSpeed3 model, likely with a 250-plus-horse turbocharged four-cylinder, uprated suspension, racer-inspired body trim. All current 3’s have a fully independent suspension, four-wheel antilock disc brakes, and antiskid and traction control. In all, the 2.5-liter is the engine to get if you want acceleration that’s more than merely adequate. But every member of this lineup is distinguished by sporty handling that, along with the styling, is a real selling point. Yes. The holistic approach to better efficiency and reduced weight pays off in some of the best gas-mileage ratings in the class. EPA fuel-economy ratings for the 3 sedan with the 2.0-liter engine are 29/41/33 mpg city/highway/combined with manual transmission and 30/41/34 with automatic. The 2.0-liter hatchbacks rate 29/40/33 mpg with the manual, 30/40/33 with the automatic. With the 2.5-liter and the mandatory automatic, sedans rate 28/39/32 mpg while the hatchbacks score 27/37/31. Ordering an s Ground Touring hatchback with the optional i-ELOOP system improves its ratings to 28/38/32 mpg, though a similarly equipped sedan’s ratings are unchanged. Yes, primarily in safety and infotainment. Mazda Connect debuts and supports audio streaming through the Aha, Pandora, and Stitcher services along with audio SMS text messaging, and 911 emergency notification. The ‘14 also introduces several safety systems under the company’s i-ActiveSense umbrella. These use sensing devices such as milliwave radars and cameras to support the driver in recognizing hazards, reducing the possibility of a crash, and minimizing the severity of an accident. They include lane-departure and forward-collision warnings, radar cruise control, and Mazda’s Smart City Brake Support. The last employs cameras to detect objects in front of the vehicle and automatically brake it to a stop if it’s traveling less than 19 mph. The i SV sedan is well-equipped for an entry-level model, with standards that include air conditioning, power windows/locks/mirrors, USB linking, tilt/telescope steering column, even keyless entry with pushbutton engine start. However,you need to move up to an i Sport sedan and hatchback to get Bluetooth hands-free cellphone connectivity with streaming audio. Touring versions have upgraded cloth upholstery and blind-spot alert. A power sunroof is optional on the i Touring, along with a Technology Package that includes dual-zone automatic climate control, Bose-brand audio system, satellite radio, HD Radio receiver, and Mazda Connect. These amenities are standard on the s Touring and all Grand Touring models; the latter also come with leather upholstery with red stitching, heated front seats, a power driver seat, and rain-sensing wipers. The optional Technology Package includes i-Eloop, and I ActiveSenset. A navigation system is unavailable on the SV and Sport models, optional on the i Touring, and standard on all other models. Among standalone options are rear-obstacle detection, remote engine start for automatic-transmission models, and various dealer-installed accessories. Base-price range is $17,740-$27,290, including the manufacturer’s required $795 destination fee. Within the i grade, sedans have a starting-price span of $17,740-$23,540 with manual transmission and $18,790-$24,590 with automatic. Hatchbacks with the 2.0-liter engine range from $19,7040-$24,040 with the manual gearbox and $20,790-$25,090 with the automatic. For s versions, base-price range is $25,390-$26,790 for sedans and $26,890-$27,290 for hatchbacks. Loaded s Grand Touring versions can break $30,000. 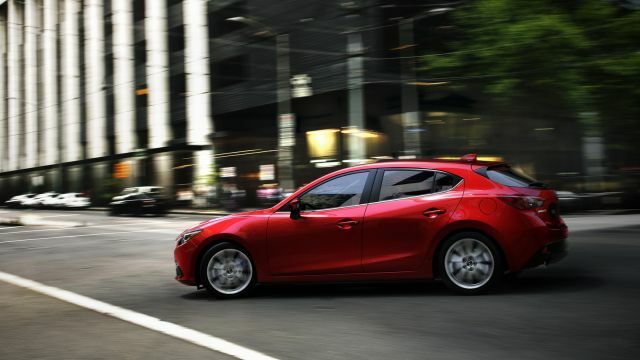 The 2014 Mazda 3 hatchback and sedan went on sale in the fall of 2013. More modern navigation graphics and software. The 7 inch screen is adequately sized and the system is controlled by a handy knob/button arrangement on the center console. But the map display is fuzzy and antiquated and it takes too many commands to dial in certain direction and audio functions. Bluetooth ought to be standard even on the entry-level model because it’s a safety feature. And for the driving enthusiasts among us, making a manual transmission available in the s versions would put the extra power of their 2.5-liter to excellent use.